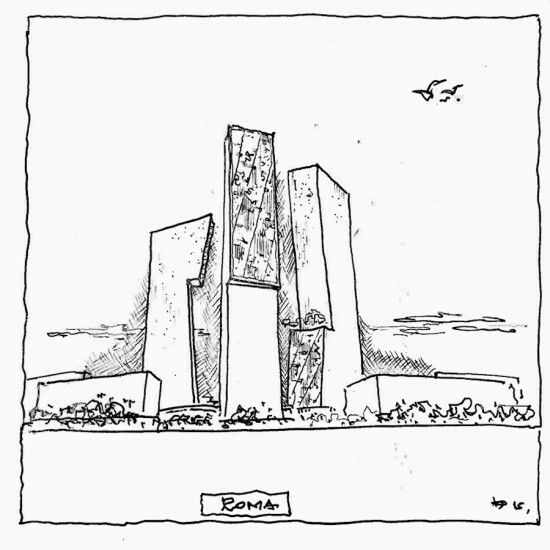 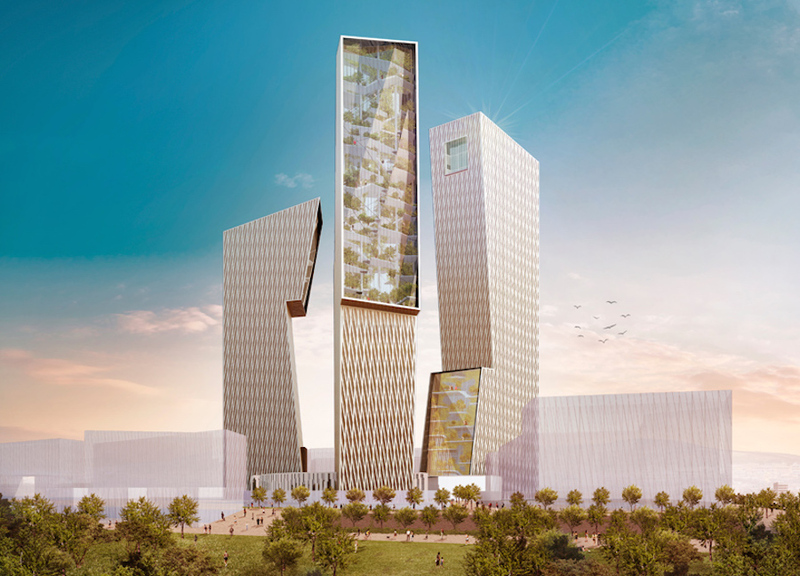 Designs revealed by starchitect Daniel Libeskind for a trio of office towers in Rome’s Tor di Valle district beget interlocking building blocks, despite varying in height and shape. 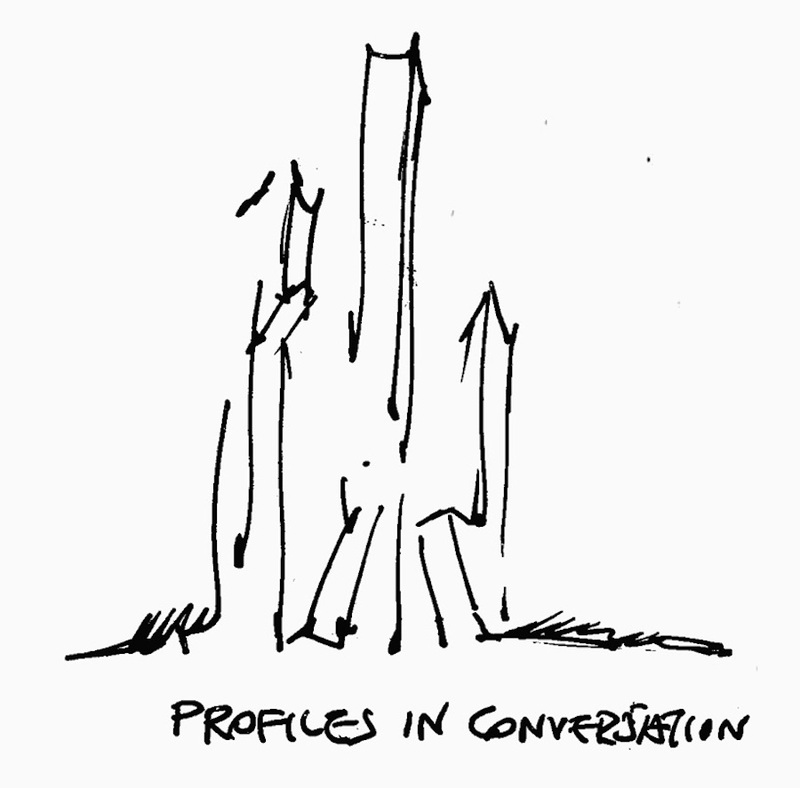 Arranged in triangular formation on a 32,000 square foot public piazza, the structures, peaking at 721 feet tall, work “in conversation” with one another as if the product of a single stone block. 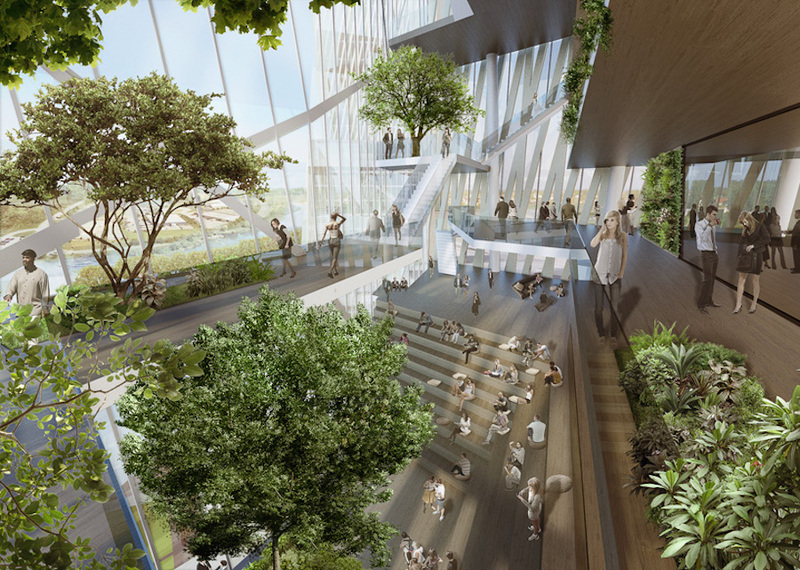 Landscaped with vegetation and reflecting pools, the interiors strive to perpetuate a similar nature-inspired aesthetic. Each asymmetrical tower is clad in a mesh of opaque panels that punctuates its glass facade. Folded glass planes reveal interior garden expanses containing multi-level office and recreational spaces. These form atrium-like areas providing unobstructed views of the city and central piazza, while simultaneously abetting climate control through natural shading, air filtering and circulation. Tower one has two vertical gardens on opposite sides—one on the lower half and the other shielding the upper floors for efficient layout of office space. 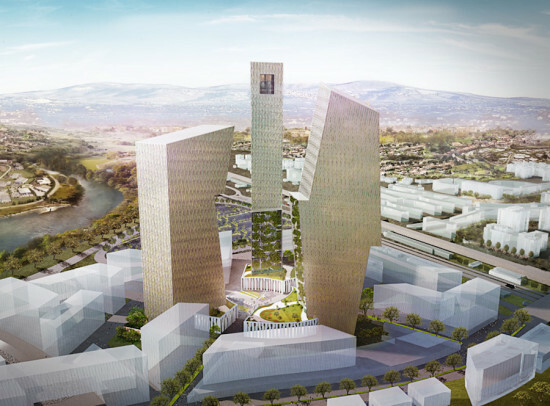 Meanwhile, all three towers will contain café and retail outlets at ground level. 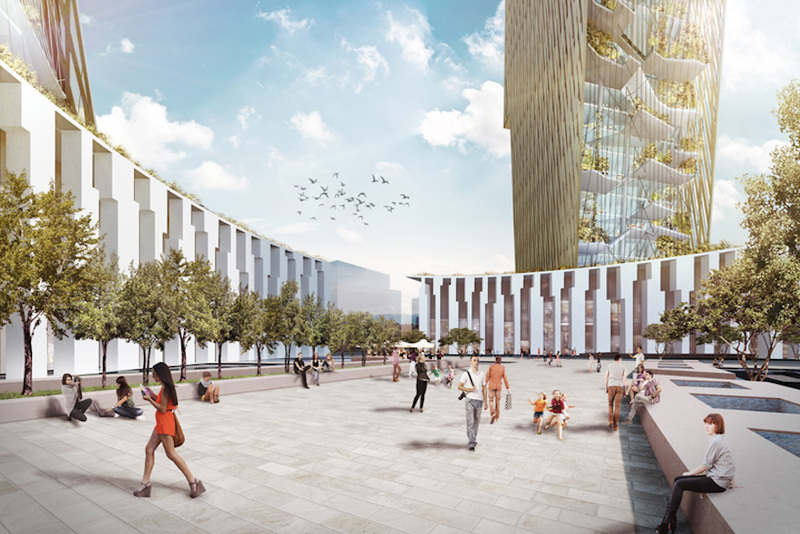 Developed by Eurnova SRL, the three-million-square-foot business park is one of numerous jostling components of a masterplan for a sustainable urban district connected to Rome’s historic center. 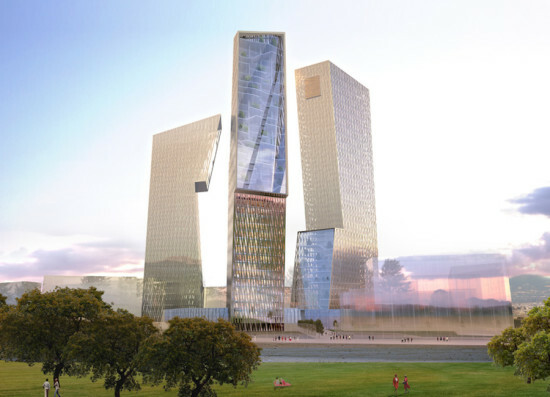 Plans envisioned by Studio Libeskind and New York–based Meis Studio include the A.S. Roma Arena stadium, training facilities, high and low-rise offices, retail, dining, and cinemas.